If I install hurricane impact-resistant windows and doors in my house, do I obtain insurance premium discounts? Yes, absolutely. In order to obtain the discounts or credits, all of the house openings must be protected. Homeowners with questions about mitigation should contact their insurance agents to make sure they are receiving proper credit for any steps taken to strengthen their home. Citizen offers premium discounts to those policyholders who show proof of risk mitigation alternatives. According to Florida statute 627.0629 regarding residential property insurance, all insurance companies that provide homeowner's insurance to residents in Florida must offer some type of discount for dwellings that have an effective windstorm protective system installed. What is the main assembly difference between a standard-glass (single glazed) and a hurricane impact-resistant window? Impact windows and doors main design characteristics are the shatter-resistant glass securely fastened to a heavy duty aluminum frame. The impact-resistant glazing consists of two layers of annealed or tempered glass bonded to an intermediate layer of a shatter-proof membrane. This membrane is typically made of Polyvinyl Butyral (PVB), a plastic film which varies from .015 to .090 inches in thickness, depending on the design pressures needed. If the outer glass breaks, the shattered pieces will adhere to the PVB film. In contrast, standard-glass windows are made of standard float glass that, when broken, will fracture in large sharp shards. Why are high-impact windows (or any other impact protection system) so important to maintaining the structural integrity of the roof of a property? Windows play a crucial role in maintaining the building envelope of a structure. A broken window can easily be the trigger for a massive destruction of a structure during sustained hurricane forces. When high-speed winds enter a house, they create a significant difference in inside/outside air pressure. When this difference occurs, the structure is most likely to loose its roof in order to provide a way out to the sustained pressure. It is widely known now that when a structure loses a window and allows for a point of entry to the wind, massive destruction will follow. Do hurricane windows and doors come in different glass colors? 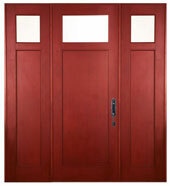 Yes, hurricane windows and doors are available in a variety of color tints, including gray, bronze, blue and green. Can impact windows help improve energy efficiency in my house? Yes, absolutely. Impact windows and doors can be configured to have low emissitivy glass (commonly known as LowE glass) to significantly improve energy efficiency. With the current LowE glass technology, a homeowners can obtain high levels of year-round confort while achieving important energy savings. The latest LowE glasses, including PPG's SolarBan 70XL or Cardinal's LoWE 366, deliver the ideal balance between solar control and high visibility. This balance represents a great feature. In the past, visibility was really compromised in order to obtain high levels of solar-generated heat transfer into the house. When ordering your windows and doors, homeowners have the option to include this special glasses in their impact windows and/or doors. The U-factor is a measure of how well the window or door keeps heat inside the structure or home. For homeonwer's understanding, the lower the U-factor, the greater a window's resistance to heat flow and the better its insulating properties. Hence, the lower the U-factor, the better is the window/door assembly in blocking the the heat transfer. Miami residents should know that low U-factors are most important in heating dominated climates, that is, in northern regions with cold weather. Although a low U-factor is beneficial in cooling dominated climates like South Florida, a low Solar Heat Gain Coefficient value is a much desirable feature to have in the impact windows and doors. The Solar Heat Gain Coefficient (SHGC) represents the amount of heat going into a house. The lower the number, the less heat penetrates the house. When a home is primarily air conditioned, the SHGC value is the correct rating to inquire about. Hurricane impact-resistant windows or doors with clear glass feature a SHGC of 0.72, while Bronze and Gray glass hold a 0.55 and 0.56 SHGC value, respectively. These values can be lowered to less than 0.30 when using a LowE glass, such as the SolarBan 70XL, SolarBan 60 or LowE 366. Ultra-Violet (UV) beams, a portion of the solar spectrum not visible to the human eye, causes fabric to fade over time. When comparing UV readings, it is important to know that the lower the percentage, the more UV is being blocked. For example, a 0% U-V value means 100% blocking. Clear, gray and bronze impact-resistant windows and doors provide 100% protection, that is, 0% U-V penetration. How can I make sure that the windows or doors that I am purchasing are in fact impact-resistant products? For a window or door system to be considered impact-resistant certified, it must meet testing standards set forth by the American Society for Testing and Materials (ASTM). One of the most rigorous requirements comes from the Florida Building Code which, given the increase in frequency and strength of hurricanes in recent years, has incorporated many of the lessons learned from prior hurricane-driven disasters. The Florida Building Code, for example, requires that every exterior opening in a structure be protected against wind-borne debris. This protection can be accomplished by either storm shutters or by impact-resistant windows and doors. To learn whether or not a product is considered impact resistant, ask your window dealer for a copy of the Notice of Acceptance (NOA) issued by the Miami-Dade County. The NOA is the document issued by the County which provides specific information, including dimensions, parts, materials, accessories and installation guidelines, about the particular product in question. The NOA certifies whether or not the product has passed the impact-resistant test. This product also sets forth an expiration date until which the approval has been issued for. NOAs can be downloaded at the Miami-Dade County's website. I read a NOA and saw two different types of impact-resistant windows. There is the small missile and the large missile. What is the different between the two? The test for large missiles consists of firing, from a cannon, a six-foot, 9-pound 2x4 piece of lumber at the window system at 50 feet per second. Basically, the window system must remain intact after the lumber makes impact against the window glazing. The small missiles test, on the other hand, exposes the window system to a variety of impacts with 30 pieces of roof gravel at approximately 80 feet per second. What are the wind load calculations? Wind load refers to the forces or pressures exerted on a structure and the components comprising the structure (i.e., garage doors, entry doors and windows) due to wind. Wind-load pressures are displayed in positive and negative numbers because wind pressures are assumed to act both toward and away from a building surface. When the forces act toward the structure, they are categorized as positive pressures. On the other hand, when wind pressures act away from the structure, they are labeled as negative pressures. Impact-resistant windows and doors are tested for both pressures, negatives and positives. The NOAs show detailed wind-load pressures for each window dimension that passed the test. Wind-load calculations refer to the both negative and possitive pressures that structural engineers will calculate for us in order to cost-efficiently design a glazing solution for a specific property or structure. Without the wind load calculations, we don't know with certainty if the window meets and exceeds the potential wind forces during a hurricane. Are garage doors tested for impact-resistant compliance? Yes, absolutely. Garage doors typically account for the largest opening in a building and are a critical component to the structural integrity of the building's envelope. As a result, the building code is very specific about rating garage doors. Are impact-resistant windows and doors very expensive in comparison with other alternatives? Based on the numbers above, the impact-resistant window can cost only $134 more than a non impact with a storm panel. If the costs of pre-storm preparation are factored in over a busy hurricane season, then impact-resistant windows will prove more economical. In addition, if we consider other important features provided by impact-resistant windows, such as passive protection, noise reduction, UV blocking and increased security, we find that having impact-resistant glass is a much more beneficial option. It is important to highlight that the costs highlighted above are for the product only. For a complete proposal, please call one of our project managers to prepare a detailed quote that includes engineering, permit expediting and professional installation. I am a first-time homeowner and need to purchase windows for my house. What are the characteristics that I should look into to differenciate one window contractor from another? Price versus quality and service: Price always comes to the top of any lists when comparing any two items or services. Deciding between window contractors is no exception. However, you must be careful since you get what you pay for. What at first seems inexpensive can quickly become costly and lead to a very stressful situation. Typically, companies charging less prices take significant shortcuts in order to mediocretly deliver on their promises, if at all. Window installation has its particular tecniques and require labor training. Some window companies outthere save on labor expenses by hiring untrained installers. Appearance and Function: The majority of the manufacturers have impact-resistant windows and doors made out of aluminum framing offering somewhat the same product styles, such single-hung, horizontal rollers and casement windows. However, not all the windows are made equal. Look for the finished quality of the paint and the silicone used to seal the joints. Also, look for consistency in the way the window is assembled. It is very important that you see a window operating, that is, opening and closing the panes. Service: Once your windows are installed, it is important to know how reliable is the manufacturer's service department. First, if for any reasons something happens to your windows in the future, you want to know ifthe manufacturer will be around. Secondly, the manufacturer will address your potential problems by sending out a service crew to make adjustments or fixes.